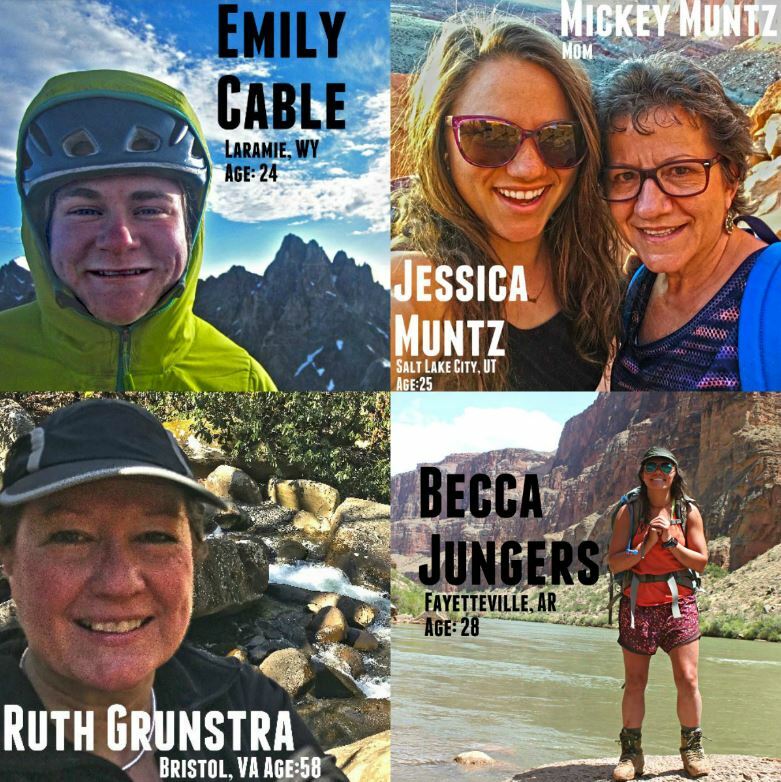 In the season of Mothers Day and support of the women in leadership/force of nature campaigns being put on by Outdoor Magazine and REI, we interviewed some of the strong women we know who have continually stepped out into the wilderness. Take a look below at 5 strong women who are fearfully and wonderfully made and just so happen to be SROM Alumnae! How did your own mother inspire you to explore and adventure in wilderness? EC: My Mom played a big role in getting me into the wilderness. Many nights between the ages of 6 to 11, as she tucked me into bed, I would ask her to tell me a “Real-life story”. It was listening to those tales of her backpacking trips and peak attempts, through thunderstorms and across narrow ledges, combined with our own family camping, hiking, and fishing outings that instilled in me a love for wild places. My mom models well the gifts of curiosity and wonder. I’ve learned from her the value of basking in a moment, stopping to smell the wildflowers, rejoicing over a sunset, and thanking the Lord for His amazing creation! JM: Ever since I was young my mother, Mickey Muntz, encouraged me to pursue my goals and “wild ideas”. On family camping trips she would let me plan our entire menu and packing list, since I so loved organizing, which in turn gave me ownership in our outdoor trips. RG: I started camping at 6 months. Every year my mom and dad would take off one full month from work, pull my younger brother and me out of school (with assignments from the teachers) and we would go camping and rock hunting (my dad’s passion) around the country for the month. Then my dad got a job as a school teacher and my mom got a job as a teacher too so we could take the whole summer to camp. I was in college before it dawned on me most other people didn’t grow up like that. My parents continued to camp until they physically couldn’t. My mom planned camping weeks with the grandchildren throughout the last decade. 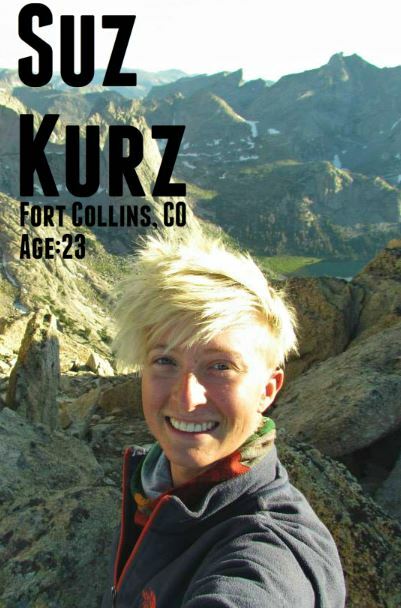 She would plan crafts Bible lessons and lots of hikes, many on sections of the AT. BJ: She let go of my hand. I’ll elaborate. I remember when I was 3 or 4 and there was this railing on a bridge in my neighborhood that I always liked to walk on. I’ve always been drawn to high places. My mother would always hold my hand, but one particular time I was certain I could walk on my own. So she said okay and let me walk on the railing like a balance beam. Her hands were right there in case I did fall, but she let me do something on my own, for the first time I can remember. I am forever grateful that she has trusted me and supported me in very similar ways since then. She herself is not much of an adventurer, but she has always encouraged me to do what I love doing. SK: Although my mom has never been very active in the wilderness herself, she had always been one of my biggest supporters of my adventures. She always asks questions about what I’m doing, where I’m going, and how the experiences effect me. She asks me what my dreams are for my future and prayed a lot for me. I think what inspires me the most is how she trusts God to lead and protect me when I am in the wilderness. Why do you think wilderness is important? EC: Wilderness arouses wonder. It is a place where hearts more easily open and ponder, character is revealed and formed, and where comfort and ease are viewed through the lens of challenge and contentment. Wilderness is important because it forces us to simplify, slow down, and reflect on the moment and the past. It is in wilderness were the Lord is seen ever so clearly. His creation declares His glory! JM: I believe that wild places are important because the genuine peace experienced in nature reminds me of our Creator and gives a recharged perspective on life. RG: We recharge and are able to refocus in the wilderness. The wilderness helps me put things in perspective. If you’re searching for meaning, or clarity I believe God is more evident, or at least easier to access, in the wilderness. Plus it’s raw. There’s always an element of danger that makes your senses come alive. BJ: It’s hard to tell someone why the wilderness is important before they experience it themselves. Nature is alive. It is a living, breathing organism and I don’t think we know how alive we can become, who we are really, until nothing else is propping us up. Our everyday surroundings (people, jobs, social activities) have a way of clouding our vision from time to time if we don’t get away, re-orient our hearts and return with fresh vision, solidified values and a re-ignited passion to keep going. SK: I believe wilderness is important for several reasons. One, it forces you to look outside of yourself. It is hard to be self -involved when you are in the grandness of the backcountry. And second, you have to grow. Being in the wilderness challenges your very core being. It helps align mind and spirit while also making it necessary to be involved with those who are out there with you. Thirdly it’s just plain fun! The wilderness is a place to find yourself and expressed who you are in new ways. You’ll always come back with a story. What draws you to wilderness places? EC: Adventure! Wilderness makes me feel so small yet so deeply cared for by my Heavenly Father. I love to venture into creation because I know that every time I do, whether it’s for an early morning ski, afternoon hike, or 40 day backpacking trip, my heart will be refreshed! JM: The possibilities, the remoteness, the peace I experience individually, the joy in sharing it with others, the space for depth in conversation, these things draw me to the wild. RG: Raw beauty. Pushing my limits. I crave what’s real, truly beautiful and outside my comfort zone…the wilderness is where I find that combination. BJ: I’ve learned much of who I am. I’ve learned of who God really is by gospel and re-gospeling myself via the wilderness. Also, conversation. There is something about no internet, no phones, really no screens in general that allows people to talk about what’s really important to them, what they’re most passionate about and their true personality breaks through. I’m drawn to the wilderness because of realness. I got a tattoo of a mountain skyline that stands for the latin term, ‘Coram Deo’ this means, “To live one’s entire life in the presence of God, under the authority of God to the Glory of God”. This is a place where nothing escapes him and you cannot escape his penetrating gaze and heart (as R.C. Sproul wrote). I feel the most exposed, dealt with, encouraged, challenged, convicted, light-hearted and alive when I’m in the wilderness…so I keep going back and back. SK: I’m drawn by the solitude, wildness, and exploration. Wilderness it’s where I feel closest to Father. It’s where I feel like there is nothing to hide and we can be together face to face. The wildness is inspiring. As an artist it is the most stimulating place for me to be. It gets the juices flowing and gives me a great perspective on life. I also love to explore and see new things. It keeps me humble and at the same time pushes me to go further and keep being curious. What is your favorite “God” moment in the wilderness? 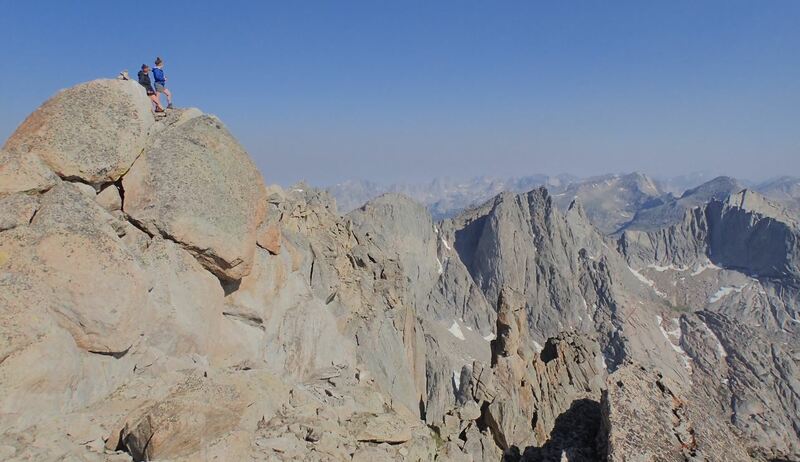 EC: During a 48 hour solo in the Wind River Mountains the Lord showed me that I had been making the mountains an idol in my heart and then allowed me to find my true satisfaction in Him! There are so many! Another one of my favorites is taking people to the mountains for the first time and delighting in their giddy excitement and marvel. JM: One favorite moment that comes to mind is when I was working one summer in Antelope, Oregon. My friend Megan and I were walking back to our cabin late at night and were talking about how God answers our prayers and listens to us. This is when Megan looked up to the sky and asked “God, can you please give us a shooting star! ?” In that same moment, the brightest most vibrant shooting star either of us had ever seen burned across the sky. That very moment has encouraged and reminded me of Gods presence countless times in life. God is always listening, it’s so basic, yet so incredibly true. RG: The night sky when the stars are so vast and clear they look as though they could be plucked from the sky. Puts me and my life in perspective. That God loves, and died for, an insignificant speck of dust like me is overwhelming. Happens every time I see a clear dark night sky. Specifically I remember feeling close to God on a backpacking trip in the Uinta Mountains in northern Utah. I was about 15 and we were out for about a week or a little longer. 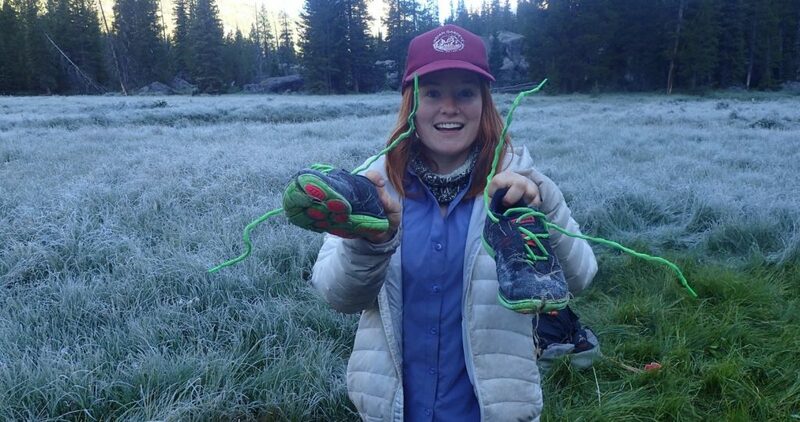 I lost my saddle shoe (absolute favorite) in the mud when our van slid off the road getting up the mountain. I was pretty upset about the whole trip. Then while we were out hiking one day, we got caught in a hailstorm and hid under a ledge. I was terrified. I realized God had the choice to save us or not, so that realization was a defining moment for me. Finally, on the way out from that hike, when I saw the neon lights of “civilization,” I was disgusted by how man thinks that is appealing and attractive when it’s just a glaring disregard for natural beauty…I think I began to have my first “God wants me to be an environmentalist” moment on that trip. How much we’ve grieved God by our greed and “progress.” In that moment I began to want to keep pristine areas, around the country and even the world, for my grandchildren and great grandchildren to experience. I can’t tell you how many times I have referred back to that moment, that day, that summer, either verbally or in my heart. God is teaching me to trust Him, that He is trustworthy. We can only go as far as we can see, and sometimes we go blindly, but we trust our Good Shepard, our Good Father, because we know He went before us. What challenges do you see women today facing in adventure activities? Why do those challenges exist in your opinion? EC: Many of the difficulties I see are similar to front country challenges and often involve comparing ourselves to men in our performance. Also not allowing men we adventure with to be gentlemen. It is quite possible to be a boss-women and strong leader while being gentle and kind and building up/ empowering those around you. JM: I would say traveling/ recreating alone or with just my lady friends can be considered dangerous at times. I believe this challenge exists because women can be seen as vulnerable or weak, I oppose this by operating in confidence in myself and what I’m doing. RG: It’s still a battle for women to compete on a level playing field. But more and more are rising to the challenge and pushing that envelope. I believe the millennials are very open to equal access for all and don’t judge ppl on race, gender or any other parameter. That gives me great hope. BJ: Challenges. I think with so many marches and rallies around surrounding women’s rights at this current moment in history, I think that women in the wilderness for the sake of everything I stated above, for the pure intent of connecting with God and taking a pause on life, could get lost in the mix of trying to prove something – that we can do this thing on our own, that we’re independent. And depending on what circle you’re a part of, you could be told you should be having babies and being a mother instead of doing things that men get no scorn for, which can be confusing when that’s simply what you want to be doing with your time in that season. SK: I see women being underestimated. I know I experience this personally and it challenges me to not do the same to others. The backcountry demands a lot of a person but to then have to be proving ones self on top of that can be very difficult and even a turn off to women looking to go on adventures. It’s hard to say why I think this happens. Maybe it’s partly put on us from society but also I think it’s in our heads. Maybe we want to prove ourselves. In any case, if you are surrounded by friends and family that encourage and support you and you have a relationship with God, you can look at challenges as opportunities. And that’s how I like to think. As a mother, how do you encourage and empower your children to keep exploring wilderness? RG: Do it as a family! Although my husband and I took our kids camping multiple times over the years, we were not able to take off every summer like I did growing up. High on my bucket list was to take *all* my kids around the country camping and Rock hunting over one summer and show them all the places I remembered as a child. So “Ruth’s memory tour” was birthed. My sweet husband helped us get a class C camper (big bed over the cab) and a car with 8 seats (even though there were usually 9 of us) that could be towed behind the camper. We homeschool so I had the kids choose different areas we would visit and had them research those areas. I was able to pack up all 8 kids (ages 2-20) and head out west. My parents had a small camper and joined us for a good deal of the trip. Our 10-week trip took us to 19 National Parks (Grand Canyon, Yosemite, Canyonlands, Arches, Carlsbad, Great Basin, Yellowstone…) and to 25 states. My husband managed to fly out to Las Vegas and travel with us for 2 weeks before flying back from San Francisco. If we saw something fun or interesting, like a rodeo or fair, we could do it. Within reason. And we mailed home the rocks in USPS prepaid boxes. Lifesaver! Today, 12 years later, my kids all love the outdoors and plan trips to hike whenever they can. They camp together now as families too. With their kids and with friends. Attention all parents! Are you looking for a wilderness program for your child to take part in to get them refocused or just out for an adventure? Solid Rock Outdoor Ministries could be the right path for your teenager to take, especially if you feel like they need to get away from all of the technology that is forced on them on a daily basis. 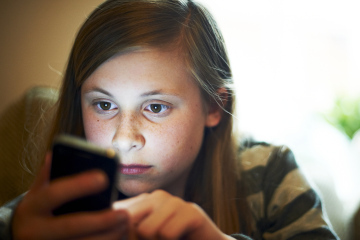 To say adios to their phone or iPod may seem like the end of the world to them, but they will thank you later! the wilderness on SROM courses to confront fears, reveal Kingdom strategies, and create authentic community while on course. We trek over trails and camp out in the elements. 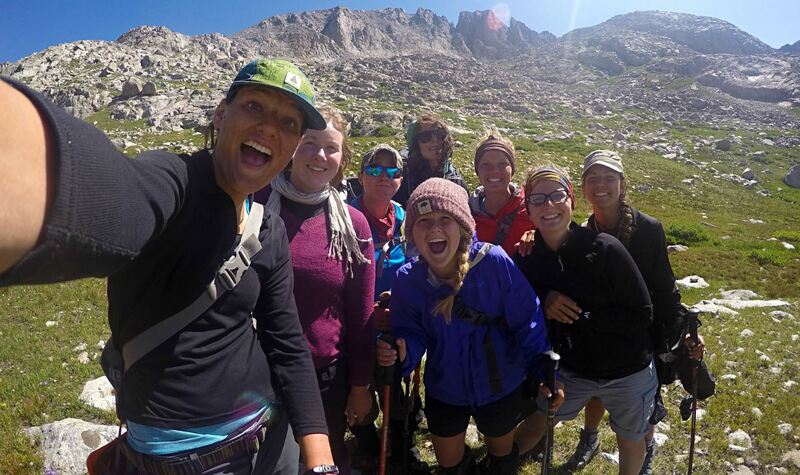 While rock climbing, backpacking and mountaineering, we’ll delve into the Bible and discuss passages surrounding God, creation, and what it means to be a son or daughter of the most high. Moreover, each participant is equipped with a devotional that’s specifically filled with Scripture to discuss, questions to ponder and answer, and applications in leadership development. 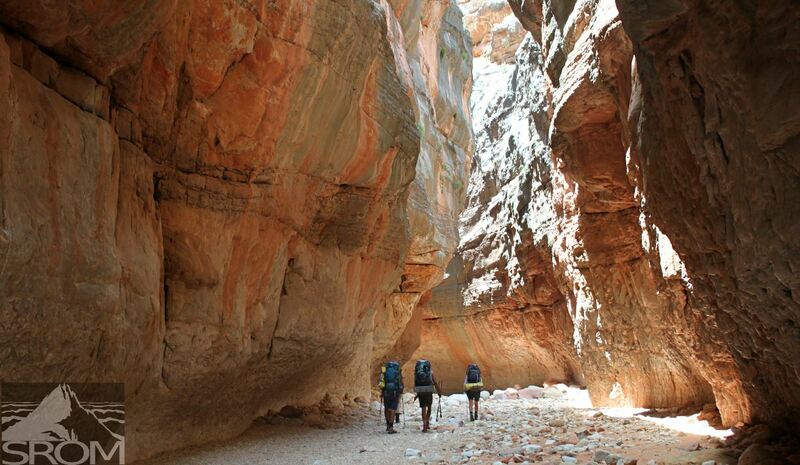 If you’d like to learn more about our wilderness expeditions, feel free to read more here. And join us this summer for a journey into God’s country! Read our students testimonials:Click Here! Learn more about who SROM is through our Mission and Core Values: Click Here! It is an important step, following a trip into our backcountry during a wilderness ministry course with SROM, to continue to walk and talk as God intends throughout your life and throughout the world. It is a dream of most to be able to embrace everyone in the world as a brother or a sister. It is time to take your relationship with God and share it with others as a missionary, proclaiming the good news of the World. This is why we consider The Nations to be a core value here at SROM. The Nations: we value devoting our entire lives to fulfilling Christ’s great commission to make disciples of all nations. We believe every son and daughter of God is called to be a missionary in their sphere of influence (John 20:21; Matt 28:19-20). A missionary is simply a person who goes on a mission to share Jesus with the world around them. Jesus Christ has chosen you, gifted you with a voice that can speak and a heart willing to share. The mission is not to spread a “religion” and earn a position in heaven, but rather that Jesus is the forefront of true life and deserves to be shared with the entire world. At some point or another, all missionaries are called by God to do His works. His word will travel through the Nations, spreading the goodness of Jesus Christ. There is only so much we can do alone – and we are not alone when we are with Christ. When we join the voices of disciples throughout the world, the world has an opportunity of becoming a better place uniting everyone in Christ. We believe this begins with wilderness ministry and finding God within yourself through leadership training and discipleship. Start your journey through SROM! We’ll see you soon! Choose from our full list of Wilderness Ministry courses and apply today! Have questions? Contact us! We look forward to speaking with you! To learn more about us: Click Here! Devote yourself to God. Go further than you’ve gone before both in adventure and in your heart. Dive deeper into your faith. Experience the outdoors and God together. Share the graciousness of the Lord with everyone you meet. Give 100% of yourself to God. Do you think you can do it? We do. 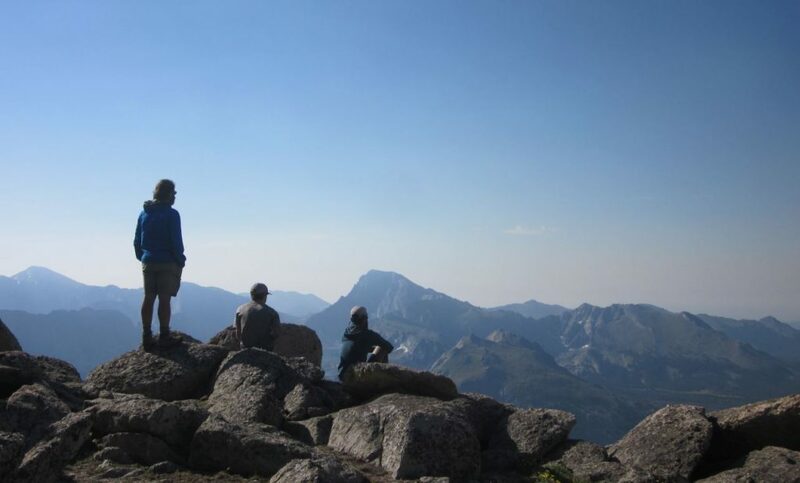 Solid Rock Outdoor Ministry bases all Christian wilderness programs around four core values: the glory of God, the King and kingdom, the Father and family, and the nations. The glory of God: we value the glory and love of God. Bringing glory to God is the ultimate goal of God and man (Ps. 19:1-6; Rom. 1:18-23; Cor. 10:31; Rev. 14:6,7). The glory of God is Solid Rock Outdoor Ministry’s first value. It is the foundation upon which our ministry is based. All things are done through God. Each day of the wilderness expeditions, students and instructors alike gather together to sing praise and worship along with group prayer. Joining our hands together in God’s name continually reminds us why we are spending 40 days in the Rocky Mountains. Instead of reading about these great and glorious places in the books or seeing them on the news, Solid Rock Outdoor Ministries actively seeks to learn through direct encounters with the natural surroundings. Experiential Education is learning by doing rather than reading or listening. There’s only so much that books can teach us without needing to apply what we’ve learned. Through these experiences, we are taking what we’ve learned and applying it through SROM’s Christian wilderness programs to further our relationship with God and others. The King and Kingdom is Solid Rock Outdoor Ministries second core value. It is intertwined with everything we do in our Christian wilderness programs. The King and kingdom: we value the person of Jesus Christ as God-King, and the reclaiming of Christ’s Kingdom on earth (Is. 9:3,7; Lk. 4:45; Lk. 8:1; Eph. 1:9,10; Col. 1:15-23; 2:6,7; Matt. 6:33). Spreading the good news is something we naturally and passionately desire to spread across the entire world! A deeper look at the supporting scripture for SROM’s value is helpful to understanding who SROM is and the role they hold in Kingdom building. 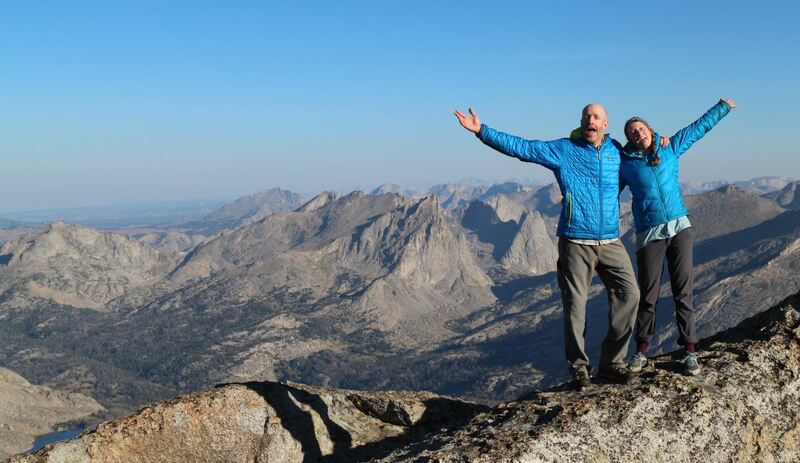 “What does evangelism even look like in outdoor ministry?” you may be asking. To some people, this is a pretty foreign concept. However, here at Solid Rock Outdoor Ministries, we say never underestimate the power of creation, especially this one big benefit: the amount of time available for relational evangelism – to sow the seeds of the Gospel and water them well. We are adopted into the Family of God through the sacrifice of Jesus Christ on the cross. As such, we are co-heirs and co-laborers with Christ. God the Father and God the Son have welcomed us into their holy, perfect family. As members of this family, as beloved sons and daughters of the most high King, we are invited to bring others into this family. This blog serves to uncover the significance of the Father and Family. We value loving God as Father and living in covenant love with His people, so that we can demonstrate the Father’s love to a lost and dying world (Jn. 14:6-14, 18-21, 17:20-26; Ro. 8:1; Jn. 1:3; Eph. 3:14-21).